You are here: Home › Living in Houston › Things to do in Houston › Houston’s Art Influence is Everywhere! If you’re new to town, you may not have heard about the Houston Arts Alliance (HAA). This nonprofit arts agency focuses on improving Houston’s arts and cultural programming. One way HAA does this is through Public Art. Initially identified as “Civic Art + Design,” the name change now recognizes a wider assortment of art projects and installations. For years, HAA has been an advocate of using public spaces for civic and cultural art, music and other happenings. These areas now include collaborations that utilize the talents of architects, designers, artists and others in the community to create public artworks throughout the city. Because of this, public spaces throughout the Houston area are transforming from common sights to beautiful attractions in artistic ways to highlight the city’s unique identity. Some of these pieces of art are permanent while others are exhibited temporarily. The Temporary Art Program (TAP) has featured many artists and their art over the years, including sculptures, installations, music and more. Past attractions include sculptures at Rice University by renowned sculptor James Surls; The Blue Trees art installation by Konstantin Dimopoulos; Ai Weiwei’s Circle of Animals/Zodiac Heads; and What Time Is It? by Houston-based artist Jo Ann Fleischhauer. The TAP program has been popular and is attracting more enthusiasm. Bringing art to Houston’s boulevards is the HAA’s next project through TAP. A series of sculptural exhibitions will be installed along the streets in response to neighborhoods requesting more public art within their communities. Be on the lookout for these sculptures soon! If you’re interested in seeing some of the permanent artwork, head over to the Looscan Neighborhood Library to see Bert Long’s mural ART/LIFE. Additionally, Matthew Geller’s Open Channel Flow is at the Sabine Street Pump Station. You can also go to the Bush Intercontinental Airport to see Radiant Fountains by Dennis Oppenheim. Whether you’re days, weeks or months into your Houston relocation, discovering exhibitions and artwork from artists and the community is a must. Even if you’ve been in the city for years, the Houston Arts Association is continually in collaboration to bring new public art installations to Houston. 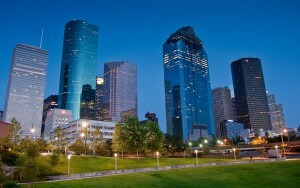 Houston offers a diverse community and terrific art scene!